Ever been to a barbecue where the vegetables sit there to wilt while everyone scarfs down burgers and “artisanal” hot dogs? Hey, artisanal means healthy, right?! Burgers and hot dogs are awesome, but vegetables have the potential to steal the show if they’re done right. The truth is – it’s easy to cook meat once you get the heat and timing thing down, but making vegetables taste good is a little more nuanced. Here’s the secret: Vegetables really need a good dose of fat to become showstoppers. Think butter, cheese or aioli. Don’t worry, you don’t have to die by dairy if you’re lactose intolerant. There’s a zillion ways to add a dose of delicious to vegetables, no dairy necessary. 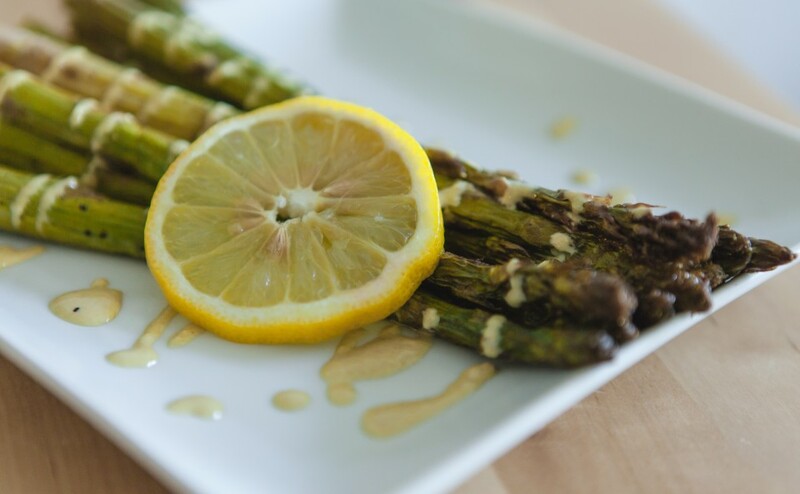 Just in time for your Labor Day Weekend BBQs and outdoor fêtes, we’re sharing Integrative Nutrition Health Coach Lula Brown’s recipe for Grilled Asparagus with Caesar Drizzle. This side dish is smoky, rich and satisfying. It’s also gluten-free, dairy-free, vegetarian, paleo, and even Whole30-approved. Best of all, asparagus is great for your skin because it contains vitamins A and E whose antioxidant properties prevent the formation of free radicals (aka unstable molecules that break down cell membranes, destroying collagen and causing wrinkles in the process). It’s also full of folic acid which acts to firm your skin and reduce aging. Sounds like a self-care appropriate recipe to us! 2. Rinse and pat dry asparagus. Trim tough ends. 3. Arrange in one layer on large baking tray. Drizzle liberally with olive oil and sprinkle with salt and pepper. 4. Roast for 15-20 minutes, until very tender and golden-brown. 5. Peel and roughly chop garlic. 6. Add egg yolks to high-speed blender. Blend on high for 15 seconds. Slowly start drizzling in olive oil while blender is running. Turn off blender. 7. Add garlic, anchovies, mustard, lemon juice, salt and pepper to blender and blend on high for 15 seconds or until combined and creamy. Taste for seasoning and adjust if necessary. 8. Serve asparagus drizzled with Caesar dressing and with more lemon if desired. Just because Labor Day signifies the end of the summer season and we’re all gearing up for “back to school” mode (whatever that may mean for you individually) doesn’t mean that we shouldn’t be shielding ourselves from the sun’s rays while we’re out and about. 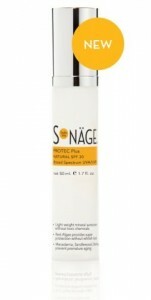 Luckily, our Protec Plus Natural SPF 30, a lightweight, natural mineral sunscreen, works hard to fight free radicals and environmental aging. This recipe originally appeared on Low Tide and comes courtesy of Lula Brown, an Integrative Nutrition Health Coach, writer and chef based in New York City. She works with women to lose weight, gain energy and get focused. Lula writes for the Institute for Integrative Nutrition and Mind Body Green, among other online publications. Photos by Sasha Landskov.